For 2018, a modified airbox improves the power unit’s mid-range response, as does a lighter balancer shaft weight. A revised exhaust serves up an even more evocative howl as revs rise and contributes to the improved performance. A significant addition to the Africa Twin platform for 2018 is its new Throttle By Wire (TBW) system, which brings with it 3 riding modes to adjust engine character and output to suit riding conditions. Also new is an extended range of Honda Selectable Torque Control (HSTC) input. The unique Dual Clutch Transmission (DCT)features the standard manual mode – allowing the rider to operate gearshifts through triggers on the left handlebar – and two automatic modes. D mode offers the best balance of fuel economy and comfort cruising whilst S mode gives three different, sportier shift patterns to choose from. The DCT is also fully equipped to operate in an off-road environment and the G button enhances off-road functionality. Pushing the G button in any riding mode modifies the control of the clutch system to give a more direct drive. Africa Twin ‘Adventure Sports’ is obviously taller, with a flatter seat profile and more upright riding position. The fairing and screen offer more wind protection and a large sump guard and side pipe fully protect the machine. An extra 5.4L fuel capacity extends range beyond 500km, while heated grips and a charging socket add comfort and convenience. The 2018 CRF1000L Africa Twin Adventure Sports will be available in one 30th anniversary Tri-colour paint scheme to celebrate the XRV650’s launch in 1988. 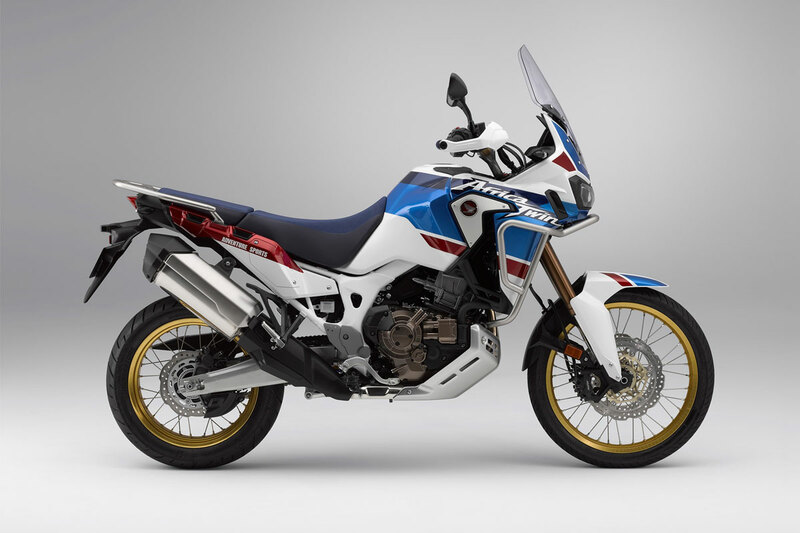 Africa Twin Adventure Sports DCT will be available in one 30th anniversary Tri-colour paint scheme.